The Turfmaster SB6000SS broadcast spreader features a salt spreader and deflector the most efficient salt spreading. The spreader effectively covers a 10 to 12-foot spread pattern, and includes a convenient fingertip cable control for making quick spread pattern adjustments. It is manufactured with a 25mm powder-coated steel frame, a rugged, heavy-duty plastic hopper with wrap-around support, and a clog-eliminating steel mesh hopper screen. 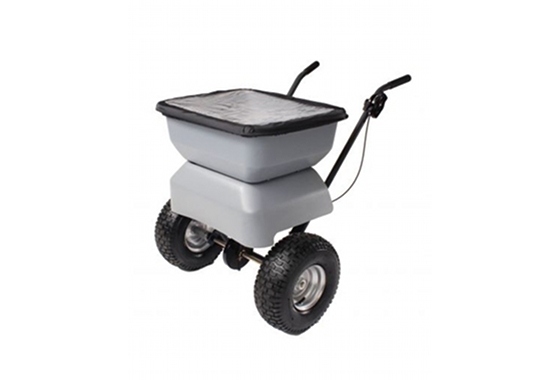 Two 15-inch pneumatic tires with steel wheels provide extra durability and smooth operation over all terrain, and a handy rain cover is included for spreading in poor weather. The above product is recommended for use with de-icing salt conforming to BS3247 which is dry and free flowing or ice-melt granules. Salt Deflector: The salt deflector is easily fitted and restricts the spread width to 22in/56cm, ideal for clearing paths and pavements. Easy Maintenance: The plastic hopper is easily cleaned and will not corrode.